You will have spectacular blue armour and will master the element of air with this Deluxe Jet Vac Skylanders Giants costume for a child. Skylanders Giants and Skylanders Spyro's Adventure are video games that are part of the Skylanders series from the company Activision. In them a line of multi-platform toy figures is combined with the world of video games, meaning that the super-powered toys come to life and ingenious puzzles and stories awaken your imagination. 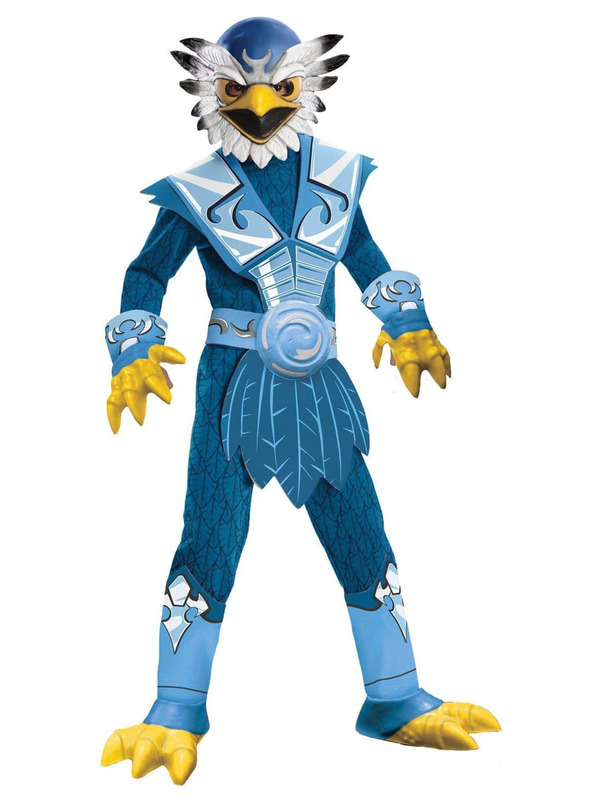 This impressive Jet Vac costume includes a blue jumpsuit with a muscular chest and printed feathers, a moulded belt also in blue, blue and yellow boot covers with moulded claws, blue and yellow gloves with moulded claws and a fascinating blue mask with white feathers and a yellow beak. Upload your photos to Instagram with the hashtag #funidelia followed by #funidelia12320. Product Rating: "Deluxe Jet Vac Skylanders Giants costume for a child"